Please call us at 1-877-354-3733 if you need a larger order. NationWide Access, LLC's family of websites is happy and proud to to distribute China Gas'sGRUBEE SkyHawk GT2B 48cc Bicycle Engine Kits at unbelievable wholesale pricing. 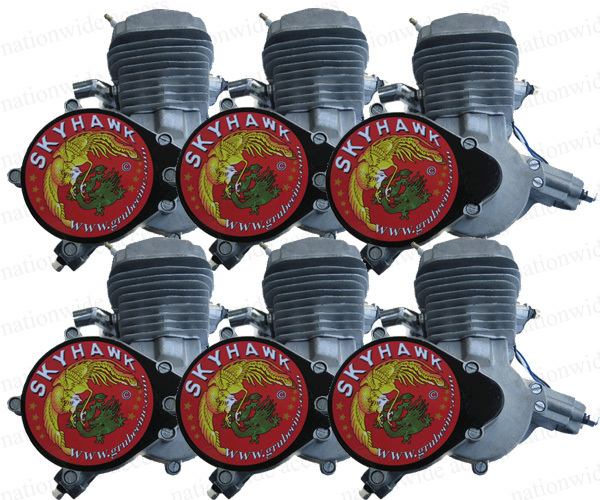 TheseWholesale GRUBEE SkyHawk GT2B 48cc bike engine kits give 1.95 – 2.2 HP “the little powerhouse engine of the industry.” The only difference compared to the other Grubee 48cc engine kits is the spark plug's design. These kits are known as the Rolls Royce of motors and have "Black Cat" Mufflers which are EPA Approved and Certified which is why we carry them and the 6-Month Warranty on manufacturer defects. California Wholesale Accounts must ship their orders to surrounding states like Nevada, Oregon, Washington,Utah and Arizona. WILL CALL for engine kits cannot be allowed. This bicycle motor engine kit comes with everything that your customers will need except the installation, gas and oil! They can stop or start the engine as they ride. There is no rope pulling needed and it goes up to 40 MPH and gets around 150 miles on a gallon of gas. Please Tell a Friendor a company investor about this wholesale product opportunity and help spread the word aboutMotorized Bicycles. Wholesale SkyHawk GT2B 48cc Bicycle Engine Kits orders can be made here.